Reigning champion Colin Turkington fully ignited his Dunlop MSA British Touring Car Championship defence with a dynamic double win at Snetterton today (9 August). He became the first driver to take a second pole position of the season after getting the better of his Team BMR stable-mates Aron Smith and Jason Plato on Saturday, as the squad produced the first qualifying 1-2-3 in the BTCC for eight years. The team backed up its pace in Sunday’s opener with a podium lockout as Turkington led home the same pairing. Turkington made a steady getaway but immediately had to fend off a passing attempt by the sister VW of Smith, as Plato looked on closely from behind. The trio settled down over the opening few laps with Smith and the ballast-laden Plato seemingly unable to keep pace with Turkington. While the gap remained fairly slim throughout the contest the Ulsterman would continue unopposed thereafter to take the chequered flag. 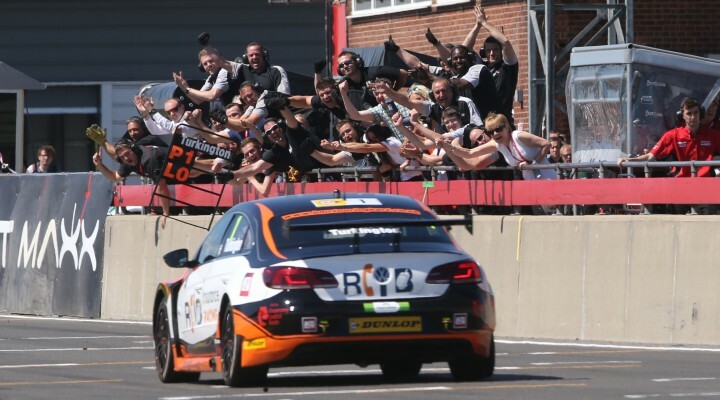 MG’s Andrew Jordan, West Surrey Racing’s Andy Priaulx and Honda’s Matt Neal completed the top six while then-championship leader Gordon Shedden endured a challenging encounter down in 14th. Things would turn from bad to worse for the Scotsman as he further relinquished his standings advantage with two non-finishes in the following races. Turkington also won the second bout as he kept away from the drama down the order to secure his third triumph of the 2015 campaign. The 33-year-old hauled his VW CC off the line and led commandingly into Riches for the first time. Adam Morgan’s Mercedes got the jump by the slow-starting BMW of Sam Tordoff, and Priaulx also nipped by his WSR team-mate before the end of the first tour. Having been hit out of race one Rob Collard’s disastrous day continued as he was fired off into the barrier in race two, and there were several other incidents that saw the likes of Shedden, Aron Smith and Matt Neal all forced into retirement. The other main title contenders made the most of the opportunity as Turkington led home Morgan and Priaulx, with new championship leader Plato taking fourth. MG Triple Eight Racing’s impressive young talent Jack Goff won the final reverse-grid race after producing a dominant performance. Goff made a great getaway from pole position and immediately set about extending a gap to the chasing pack. Running the Dunlop SportMaxx soft tyre, Goff was able to string a series of strong laps together until mid-distance. Although the performance in his rubber naturally tailed off towards the finish he was able to fend off Plato’s challenge and take the win. Plato’s VW initially had a win-lose battle with Tordoff and Priaulx’s pair of WSR BMWs, as the Team BMR star passed the former off the line before being taken by the latter on the first tour. Fifth place was held by Morgan’s WIX Racing Mercedes in the opening moments but double race-winner Turkington was soon ahead on lap two. Almost simultaneously Plato made arguably the move of the day ahead as he went late on the brakes into Brundle. Priaulx had no answer and Plato was through into second. Morgan ran wide and onto the grass at Riches as Turkington too fell into the clutches of the chasing Jordan and Mat Jackson. Carrying maximum success ballast due to his earlier victory, Turkington’s VW first had to yield position to Jordan’s Triple Eight MG before Jackson’s Motorbase Ford sneaked through shortly after. The top seven was then set until the finish, with the race undoubtedly being remembered for Goff’s first ever victory in the BTCC. As the sun set over Snetterton it is Jason Plato now leading the standings by 16 points from team-mate Colin Turkington. Honda’s Gordon Shedden has slipped to third after his difficult weekend in Norfolk, whilst West Surrey Racing’s Sam Tordoff remains fourth. Honda heads the manufacturer table but MG has reduced the deficit to just five points. WSR remain in contention in third. Team BMR top the teams’ and independent teams’ order while Turkington holds the advantage in the independent drivers’ classification. The Dunlop MSA British Touring Car Championship now moves on to Knockhill in two weeks time (22/23 August) for Rounds 19, 20 and 21. Click here for the final classification from the Dunlop MSA British Touring Car Championship races at Snetterton. RCIB Insurance Racing has received a twenty point deduction from the Teams’ and Independent Teams’ championships for having changed a further two engines above the number permitted.